Featuring: Fashioning History Alumna Elaine Nichols, senior curator at the Smithsonian’s National Museum of African American History and Culture, believes everyone has a story. This is hers. Featuring: Making Connections Researchers have given one man the ability to move a paralyzed limb with his thoughts and others the chance to feel sensations through prosthetic hands. In restoring functions for some, they offer hope to many. Featuring: She's A Mover Gina Gibny’s dance steps reverberate far beyond her New York studios. Featuring: A Brainy Idea How one student’s creation could help researchers better understand the dangerous Zika virus. Featuring: Fine Lines Tom Bachtell (WRC ‘80) creates signature caricatures for The New Yorker magazine. Featuring: True Gems World-class mentoring creates new scientists and cutting-edge materials. Featuring: An Ethical University Building a campus-wide foundation for thoughtful dialogue. Featuring: Expanding Our Reach A deliberate strategy to make a world-class university worldwide. Featuring: Exploring the Brain Research teams pursuing a broad range of projects to better understand what lies within our skulls. Featuring: Thirty Under 30 A spotlight on outstanding young alumni, from the lab to the stage. Featuring: Fantastic Four. Accomplished young alumnae achieve national acclaim. Featuring: To the Next Big Thing Academia provides the tools that help budding entrepreneurs launch companies from campus. Featuring Pulling the Plug on Paper. physicians trade in their patients' file folders for electronic medical records , discovering a family secret in a trove of old letters and the downside to bedrest. Featuring Getting the Lead Out. Fifteen years after being effectively removed from the U.S. market, the prolific danger of leaded gasoline becomes clearer , a link between common blood pressure drugs and increased cancer risk and alum and famed geek Don Knuth talks computers, contests and pipe organs. Featuring Is Bad Taste the New Taste? Social Media is Changing Our Sense of What's Acceptable—and What's Not, expert arguments regarding healthcare reform, an interview with Mad Men actor and alum, Rich Sommer, and a new technology may help wheelchair-bound individuals to walk. Featuring The Digital Divide: Kindle DX makes a splash on campus with fans and critics, researchers taking stem cells back in time, an excerpt from bestselling author Thrity Umrigar's latest novel, and insights into why good-looking people are harder to draw with New Yorker cartoonist Tom Bachtell. Featuring Full Speed Ahead: The race is one to expand high-speed rail in the U.S., a new superbug targeting U.S. military men and women, strategies for change, and a chat with Alum and Warner Bros. CEO Barry Meyer. Inaugural issue, featuring Vanishing Act: How the universe is erasing evidence of its own origins, as well as stories from inside the trial of Saddam Hussein, the truth about human trafficking, Alzheimer's research and more. For more information about back issues of Case Western Reserve’s magazines (before Fall/Winter 2008), email think@case.edu. Want to share what you're thinking? 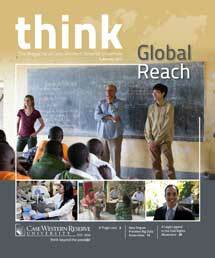 Contact us at think@case.edu.